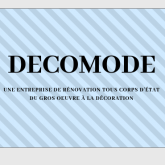 UNE ENTREPRISE DE RÉNOVATION TOUS CORPS D'ÉTAT DU GROS OEUVRE À LA DÉCORATION. 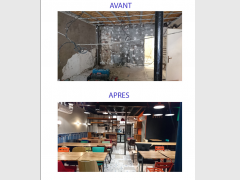 EXEMPLE DE PROJET, LE RESTAURANT LE MIM A MONTREUIL ,113 RUE MARCEAU. SUITE AU DESIR DU RESTAURATEUR DE TOUT RENOVER, ON A PROCEDE A LA RENOVATION COMPLETE ET DECORATION DU RESTAURANT. CARTE BLANCHE A ETE DONNE A NOTRE EQUIPE, AUSSI BIEN SUR LA CONCEPTUALISATION, QUE LES MATERIAUX CHOISIS ETJUSQU'A LA DECORATION. RESTAURANT TRES COURU SUR MONTREUIL , LE PROPRIETAIRE NOUS A SOLLICITE POUR UN DEUXIEME PROJET DE RESTAURANT. SITUE CETTE FOIS CI A RUE DE MONTREUIL DANS PARIS 11EME.